This side of heaven, there will always be need. God enables us to be a part of meeting the needs of others. He asks we do so joyfully not with bitterness and resentfulness. “Whatever you give is acceptable if you give it eagerly” (2 Corinthians 8:12a). We should be eager and inclined to give. The Greek word charis means gift and grace—the word is the same for both. Charis should remind us of the grace we received so we can be gracious to give out of the overflow of our gratitude. Why? Because the Lord gives generously. Jesus willingly left the comforts of heaven to come to earth, so you and I could live. The Cross should change us and motivate us. If God provided the ultimate provision for each one of us, why are we so afraid to think He will not continue to provide for us and others through us? Are there times you don’t give because of fear of not having enough? Maybe you are holding on tightly because the world tells you to hold on. Are you saving for something you may or may not ever get or need? Parents, are you saving for your child’s college education and holding on tightly to that money while people are in need today…when perhaps God could provide a way for your child to go to college without ever having need of these funds? Are you putting a lot of money into your 401k for retirement, but you don’t even know if you will live to see retirement? Are you living for today or saving for the maybe? Or are you being asked to give, but won’t because you don’t know if you will have enough? Don’t be reckless, but be faithful. God provided enough for the Israelites in the wilderness (Exodus 16). He provided manna. To those who gathered much, they had enough. To those who gathered little, they had enough, too. Everyone had just what they needed. The provision came with a warning. Don’t hold on to it overnight! What happened to those who did? Maggots filled the manna. For Christians, there is joy in sowing seed and sharing with others. Unity is brought among Christians when we give joyfully. We don’t give with a complaining heart; however, we give with an empathetic heart. We don’t give by holding back from something by giving to another. That’s just a transfer of funds. You see, the churches in Macedonia, Galatia, and Corinth still needed to take care of their own church business in addition to taking care of the needs of others (specifically in 2 Corinthians 8, the church in Jerusalem). We shouldn’t watch a church, ministry, or family in need struggle and fail because they are giving to help others. God never asks us to go without to help others. “Of course, I don’t mean your giving should make life easy for others and hard for yourselves. I only mean that there should be some equality” (2 Corinthians 8:13). Christian giving is marked by generosity and may entail sacrifice at times. What does it look like for our modern-day sacrifice? Maybe it means we don’t take that vacation this year or eat out so much for a month. Or maybe it means we go a season without buying new clothes. Maybe it means giving up a hobby for a season. What is it that God has been asking you to give up so you can bless others? In 2 Kings 4–7, we meet a widow who owed a debt. If she didn’t repay the debt, she risked losing her sons to her creditor. She desperately needed help from others. The prophet Elisha told the widow to go to her neighbors and ask for empty jars. She obeyed Elisha and gathered all the available jars. Elisha then told her and her sons to go inside their home and pour the only remaining thing they had of value—the small jar of anointing oil—into the jars. The oil filled every jar. He then told her to go and sell the oil. She not only had enough to pay off her debt, but she had money left over. Giving is not always about writing a check or making an online payment. Giving is also about serving. If we can provide the gifts someone needs with a joyful and willing heart, we can lessen their burden. This is a sacrifice of our time. Most often, we have what others need at our disposal. We have funds—even if they appear to be limited—and we have time and talents. However, we must decide before the needs of others arise whether we will have generous and joyful hearts when God asks us to give, go, or serve. We need to prepare our hearts in advance for the work God will ask us to do because if our hearts aren’t right with God and aligned with His will, we’ll hold on tightly to what we have as if it is our own. Prepare your heart today to always be available to generously charis others. The simplest act—giving a jar—could save someone’s life. 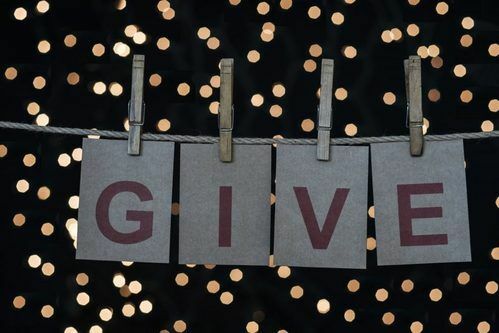 This blog, "What Kind of Giver Are You? first appeared on Daughters of the Deep.